This chapter aims to highlight the relationship between innovation and internationalization in the context of international development of Lebanese innovative SMEs. The problems of the commitment of these SMEs in a process of internationalization is relevant in the Mediterranean countries in general and Lebanon in particular, but few empirical studies have been done so far to understand their international development (Ramadan, 2008; Ramadan and Levratto, 2011). The role of key factors such as size, age, international cooperation and strategic planning in the international development of Lebanese SMEs has rarely been comprehensively studied. Motivated by the literature that establishes a positive relationship between innovation and internationalization, this study presents a research proposal on these SMEs to bring out certain variables that characterize them. Moreover, the aim of the study is to verify the effect of the above factors and integrates into schools of thought that attempt to demonstrate that the international development of SMEs is influenced by a context that must be identified in the case of Lebanon. The reduction of trade barriers, the acceleration of business opportunities and increased competition (Nummela, 2004) characteristics of globalization have led companies and countries to adapt to this new context. Henceforth, a growing number of companies looking for larger markets, to achieve economies of scale, develop new products, reduce production costs, new markets etc. Although this opening can sometimes endanger their existence insofar as it is often accompanied by new threats and additional risk, it is considered by economists, entrepreneurs themselves and public institutions as a condition sine qua non of their competitiveness, but also for their survival. SMEs do not escape this logic. The attention given to internationalization (OECD, 2004) is proportional to their contribution to the activity and the creation of economic growth. SMEs are universally regarded as one of the main forces of economic development due to their contribution to the creation of wealth and jobs in both OECD countries and in developing countries (Ramadan and Levratto, 2011). In this context, SMEs are required to be constantly updated as to the current knowledge for innovation. It is certainly recognized to SMEs to be flexible and innovative. But this flexibility and innovations had, until recent years, local significance. The importance of the link between innovation and international development of SMEs is a key element for competitiveness. This relationship emphasizes the potential of the technological capacity of SMEs through their participation in a cooperation between businesses at the local, national, international and higher institutes of education and research (Ramadan, 2008). The problematic of the commitment of innovative SMEs in a process of internationalization is a current interest in the Mediterranean countries in general and Lebanon in particular, but few empirical studies have been made so far to understand their international development (Ramadan, 2008; Ramadan and Levratto, 2011). The role of key factors such as size, age, international cooperation and strategic planning in the international development of Lebanese SMEs rarely been the subject of a comprehensive study. 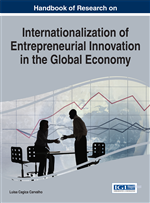 Motivated by the literature that establishes a positive relationship between innovation and internationalization (Le Roy et Torrès, 2008), this study presents a research proposal on Lebanese innovative SMEs to bring out certain variables that characterizes them. Furthermore, the goal of our study is to verify the effect of the above factors and integrates into currents of thought that attempt to demonstrate that the international development of SMEs is influenced by a context that we must identify in the case of Lebanon. In order to gain a more comprehensive view of the problem studied, the theoretical framework developed in this paper presented our own conceptualization of the internationalization process to the Lebanese SMEs. The possible specificity of the internationalization of these companies is a question to be asked. That is why through this communication our ambition to take the first steps for a study on the articulation innovation-internationalization of Lebanese SMEs. In examining this relationship, innovation is an important aspect in the prosperity of innovative SMEs (Le Roy and Torrès, 2000). However would there be a role of the size of innovative SMEs in their internationalization? What is the profile of innovative SMEs that internationalize? Is that all innovative SMEs are internationalized to ensure their survival? International cooperation of innovative SMEs is an asset for innovation and internationalization? These are preferred questions in the specific context of Lebanese SMEs. The research is organized as follows. In the first section, we discuss the main theoretical and empirical work that has been done on the internationalization of SMEs. The second section, we review the relationship innovation-internationalization. A conceptual framework based on existing literature that reflects our personal reading of the issue raised in the Lebanese context in the third section. Finally, the last section tests the robustness of the assumptions concerning the internationalization of innovative SMEs in the Lebanese case. Network Approach: According to this approach, internationalization of the firm can be achieved through creating relationships in foreign country networks that are new to it ; the development of relationships and increasing resource commitments in those networks in which the company already has a position (penetration) or connecting the existing networks in different countries. Globalization: Globalization implies the opening of local and nationalistic perspectives to a broader outlook of an interconnected and interdependent world with free transfer of capital, goods, and services across national frontiers. Innovation: The term innovation can be defined as something original and, as a consequence, new, that “breaks into” the market or society. Internationalization: Internationalization has been viewed as a process of increasing involvement of enterprises in international markets. SMEs: SMEs stands for Small and Medium-sized Enterprises, the main factors determining whether a company is an SME are: number of employees and either turnover or balance sheet total. Uppsala Model: The Uppsala model has described the internationalization of a firm as a process of experiential learning and incremental commitments, which leads to an evolutionary development in a foreign market. International Management: International Management refers to the management of business operations for a company. It is used to conduct business in more than one country and requires familiarity with the business regulations and the ability to carry out transactions that may involve multiple currencies.